Have you ever taken a snapshot of a virtual machine that you forgot to delete afterwards? Me too. If snapshots never get deleted they can grow in size and affect the performance and stability of the virtual machine. The “Get-Snapshot”-cmdlet does not contain the username of the admin who took the snapshot, therefor I wrote an advanced function that can get this information. I’m guessing a lot of you have different accounts for administering vSphere and using e-mail, so you might need to parse the username you get back before looking up the users e-mail in Active Directory, and since this is probably pretty specific for your environment I didn’t see much of a reason to publish the script we use to loop through the snapshots. The function returns the name of the VM, the size of the snapshot (in mb), the name of the snapshot, Id of the snapshot, the Creator (username) and the time when it was created. The code for this function is available here. I would also like to credit Dave Garnar who did most of the heavy lifting in figuring out where to find the username information and was kind enough to post it in this post. I basically just created an advanced function out of it, nothing fancy. This entry was posted in Infrastructure, PowerShell and tagged snapshot, vmware, vpshere on 2014-05-30 by Anders. 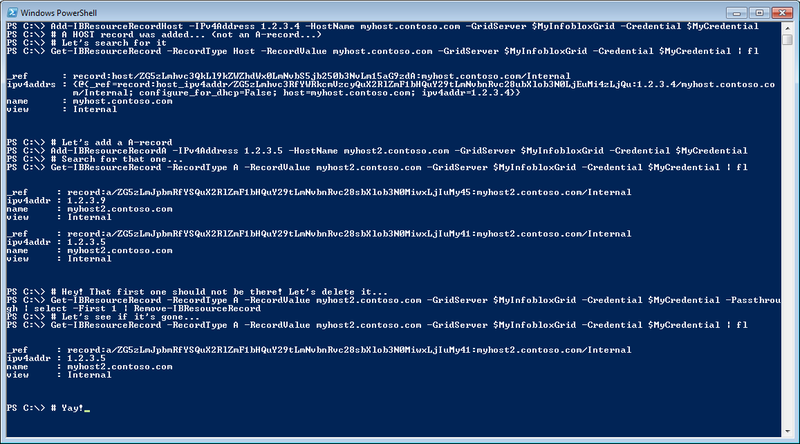 Let’s build a Infoblox PowerShell Module! If you haven’t heard of it, Infoblox is making appliances and solutions for enterprise networks. One of them is the Infoblox Trinzic DDI which manages DNS, DHCP and IPAM. Infoblox does not seem to have any plans for delivering a PowerShell module for managing their product, which is a bit weird since it would probably make it a bit easier for network admins trying to move windows engineers away from Active Directory Integrated DNS, and instead let the Infoblox appliance host all or some of their zones (which seems to be a common enough debate among enterprises). But in their defence they have released a REST-based API for this appliance which enables administrators to basically build whatever tools they want to manage anything from DNS records to IPAM. I’ve therefore started to build a module for managing DNS-records hosted by the Infoblox, but since my experience with this product is fairly limited, I thought I would post what I’ve done so far to get opinions from people with more experience with this product. This is very early in the development of this module, so it probably have a few bugs, and there are a lot of cmdlets that needs to be written! Anyone out there that wants help or have any thoughts? Please post a comment here or join this thread in the Infoblox community forum. The code for this early version of the module is available at the Github repo! This entry was posted in API, DNS, Infrastructure, PowerShell and tagged DDI, DNS, Infoblox, WAPI on 2014-04-02 by Anders. Even if you configure your User Profile Manager in Citrix correctly, keep it up date and so on, you might end up with the same problem we had; every now and then a profile contains a file that is locked so the profile doesn’t get cleaned up after user log off. When that user logs on again they might end up with a “username.domain001”-profile, then 002 and so on. And the user profile settings soon become pretty messy. One way of making this problem less of a pain, is to have a script clean up the folders (and of course the registry values) to make sure the users can get their profiles loaded correctly. As always, use any script you find on the internet with caution, and test them fully before deploying anything in your production environment. First of all, I usually set the variables that might differ from different environments and/or domains etc. This just collects all the local users on a server/computer. We didn’t want these profiles to get cleaned up since they don’t have any central profiles. # Tune performance with $SpeedBrake. Lower is quicker, but uses more CPU. This variable is used in a “Start-Sleep”-cmdlet later, this is to make sure the script doesn’t steal a lot of CPU-resources. This should be changed to match whatever you have as a standard for your SamAccountNames. the “\w” will more or less match anything, so this should be changed to something that matches your environment. This is just used for extra safety, you might not want to end up deleting a service account profile for example. If the account name contains for example “svc”, it will be ignored by the script. But what about logged on users? We don’t want to remove their profiles, do we? Now we should have all the information we need to safely go through all the profiles and remove those that we don’t want anymore. I wont go through this part “line by line”, but I think you will get the point when reading the code comments. # Set this variable to True, it will be changed if it should stay later. # This this folder match the username regex? # Again, sleep to prevent CPU load. # If it did, it should not be deleted. $WMIQuery=Get-WmiObject Win32_UserProfile -computer '.' -filter "localpath='$ProfileToClean'"
Write-Output "Deleting $WMIProfileToDrop through WMI." cmd /c rd /s /q "$CurrentProfileName"
Write-Output "No WMI-profile found, $CurrentProfileName folder was deleted though." Write-Output "$CurrentProfileName has been deleted." A few things to point out, the script always tries to delete the profile through WMI since this is the “cleanest” way of doing this (removes the registry values together with the folder). This is the same thing as going through “My Computer” to remove the profile. If there was no “WMI-profile”, it just deletes the folder. I know it looks terrible when using “cmd /c rd /s /q” instead of Remove-Item to do this, but Remove-Item has a bug that makes it a bad idea to use it for this sort of thing. (It has to do with how it handles symbol links). This entry was posted in Citrix, Infrastructure, PowerShell, Walkthrough and tagged Citrix, List local users, UPM, User profile on 2013-10-13 by Anders. To achieve this I wrote a couple of advanced functions to simplify the task. “Get-LocalGroup” and “Get-LocalGroupMember”. This entry was posted in Infrastructure, PowerShell and tagged Groups, Local, Members on 2013-10-08 by Anders.